Find the best hotels in Srinagar. 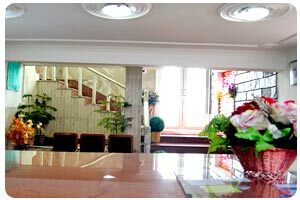 Amenities: Indoor Swimming Pool, Sauna, Whirlpool, Fitness Center, Baby Sitting, Beauty Salon, Gift Shop, Safety Deposit Box, Banquet Facility, Secretarial Service and Business Center. Hotel Jamal Resorts Our Pleasure"that's what we believe in serving you. A cozy coffee shop with open air sitting arrangement under the shadow of an in house, worlds most beautiful & standing tall tree, "THE CHINAR". The Royal Springs Golf Course (RSGC) situated near the Mughal garden and Cheshmashahi at Srinagar (Kashmir, India). The area lies at foothills of Zabarvan hills and overlooks the Dal Lake. Grand Mumtaz is one of the best hotels in Srinagar (Kashmir, India) located adjacent to Golf Course having 55 rooms. 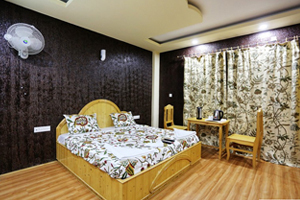 Swiss Hotel located at 1 minute walk from Nehru park bus stop, Srinagar (Kashmir, India), 2 kms from tourist reception centre and 14 kms from Srinagar Airport. Srinagar is capital city of Kashmir region and a renowned hill station ( 1730 meters / 5200 feet asl). Swiss hotel is situated under the foot hills of Shankracharya hill and near to the banks of the famous Dal-Lake. 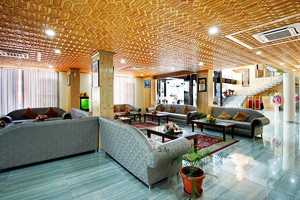 Hotel Akbar is located at Srinagar (Kashmir, India), 2 kms from downtown and 500 meters from tourist reception centre. Hotel Asian Park offers old world charm with modern amenities, each of the 75 rooms (Including 6 Suite Rooms) have been individually decorated to exude the comforts of a Traditional designs. Our Deluxe rooms are spacious and have everything you could possibly need for your stay. Our Suites are strategically placed to ensure your privacy and comfort. Hotel Shefaf is a preeminent in hospitality industry, with a distinctive collection and a reputation for excellence. Hotel Shefaf banner offer guests an extraordinary place that is created by combining unique architecture and structure, expressive decor and artistry, and magnificent features all in one great location. Add great service to this and the result is an extraordinary experience that would make your memory of Hotel Shefaf & Restaurant a long and lasting one. We serve superb food, enjoying the opportunity to share the culinary seasonable delights of our kitchen, where all products are fresh, local and organically produced. 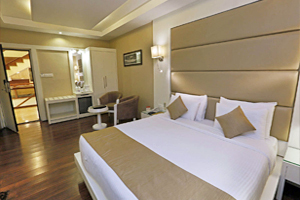 Facilities: In a renovated Rajbagh area in the popular Summer capital of Jammu & Kashmir, this elegant 4-star boutique hotel is just a 5-minute walk from the Srinagar Museum. We offer free Wi-Fi and air-conditioned rooms. All rooms at the Hotel Rose Petal are individually decorated and have classic or modern furniture. They feature High definition cable TV, parquet floors, and a minibar.Guests can enjoy live barbecue near the pool side & Bonfire is also available on request. Contemporary design meets functionality in our comfortable Deluxe Rooms, perfect for the business and corporate traveler. 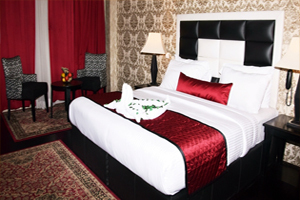 Enjoy twin or king size beds, eco-friendly bath products, mini bar, flat-screen LCD TVs and wireless internet. 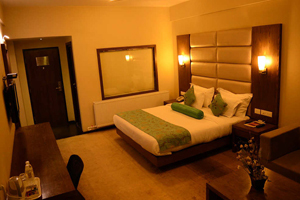 Our smartly designed Premium Rooms offer stellar views of the Srinagar city. 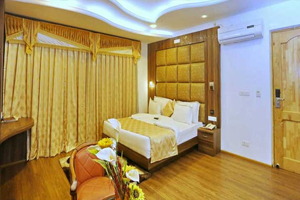 Facilities include twin or king size beds, eco-friendly bath products, mini bar, flat-screen LCD TVs and wireless internet. Also enjoy access to our exclusive executive club lounge and complimentary Wi-Fi.